This is a written version of a short presentation and exercise I did yesterday with Co-operatives East. It offers a strategy or framework for identifying and prioritising potential fellow travellers that co-operative organisations could team up with. Thought I’d post it up here to see if it’s useful . . . It was a means to an end. This will be different for different people but for me that end was, and largely still is, an economy run for and by the people, one in which we have control over the business and public institutions that exert such a powerful and undemocratic influence over our lives. Co-operatives are one important route to doing this. But they are not the only one, and there are a whole range of similar and allied organisations – community run organisations, artist collectives, user-led mental health groups, the online peer-to-peer movement, and many others, all of which have similar goals. But when you get involved heavily in a movement, an organisation or what Seth Godin calls a ‘tribe’, it’s easy to forget this – to focus on the rituals and intricacies of that tribe, to get engrossed in the details and forget the bigger purpose that made this important in the first place. The co-operative sector is as guilty of this as any other – we, by which I mean those who are active and play an organising role – spend a lot of time debating legal forms, governance and member engagement, but in doing so easily forget the purpose, the reason we were involved in the first place. So, what I want to do here – and what I’ve done periodically in the past – is to try to stand back from the co-operative movement as we know it and think about what other organisations, networks and groups are out there who have similar purposes. I don’t have any simple answers, but what I hope to offer is a framework for discussion. The reason for doing this is two-fold. The first is for reasons of organisational strategy. I was asked to talk at Co-operatives East, a membership body, about reaching co-operators rather than co-operatives, in order to get people at Co-operatives East thinking about how it, as a regional grouping of co-ops, can best meet its purpose of promoting the co-op economy. Should it open up its membership to people interested in co-operation? Who are these people? And how can it reach them? This is obviously not just of relevance to Co-ops East but also to other co-operative campaign bodies more widely. The second reason is about campaign strategy. 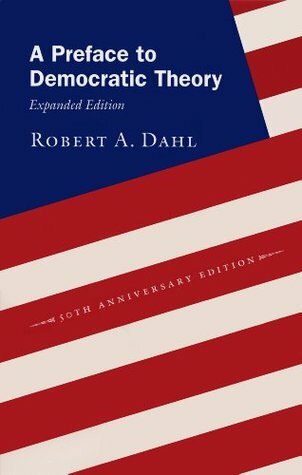 Successful campaigns are nearly always coalitions rather than single-interests. A campaign to promote the co-operative economy could have marginal successes on its own; a campaign to create an economy run for the people by the people, that involves co-ops, social enterprises, development trusts, the online peer to peer movement, the commons movement, and so on, is much more likely to have a success, assuming a common purpose and message can be found. In the UK, the Social Economy Alliance is an excellent example of this – it brings together social enterprises, co-ops, trading charities and others and combines their weight to lobby government for common asks. In the US the New Economy Coalition is a broader coalition of organisations involved in grassroots community and economic development, from co-ops to community organisations. So, what’s the best way to think about, and discuss which networks – which other tribes – are closely aligned with the co-operative movement? One way is to take the ‘scale of co-operation’ proposed by Co-operatives UK a couple of years back in its publications on practical tools for identifying co-operatives. 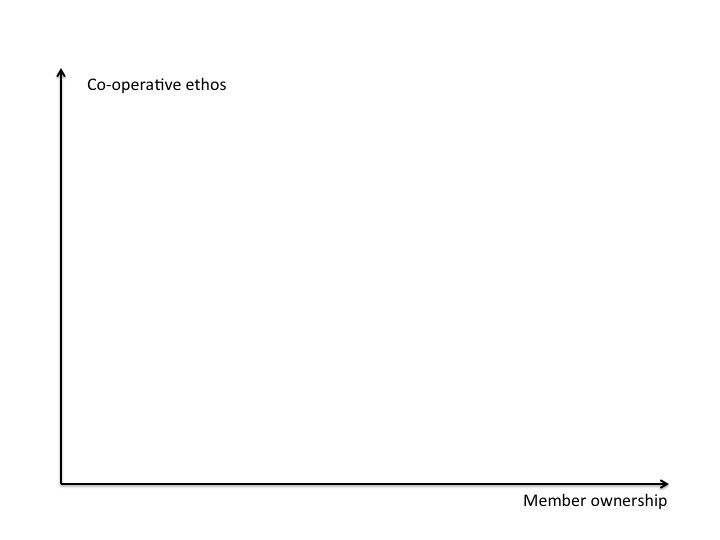 The scale looks at two axes: the member ownership axis, which is based on how far an organisation has open membership, how far the members control the business and how far they benefit from it (basically, the first three co-operative principles); and the co-operative ethos axis, based on whether the organisation is autonomous, educates members, co-operates with others and has a community purpose (the last four co-operative principles). Co-operatives UK developed some questions to ask to help plot where an organisation fits on the scale, and we can see a range of positions on the scale, from Tesco through to Suma, based on this. 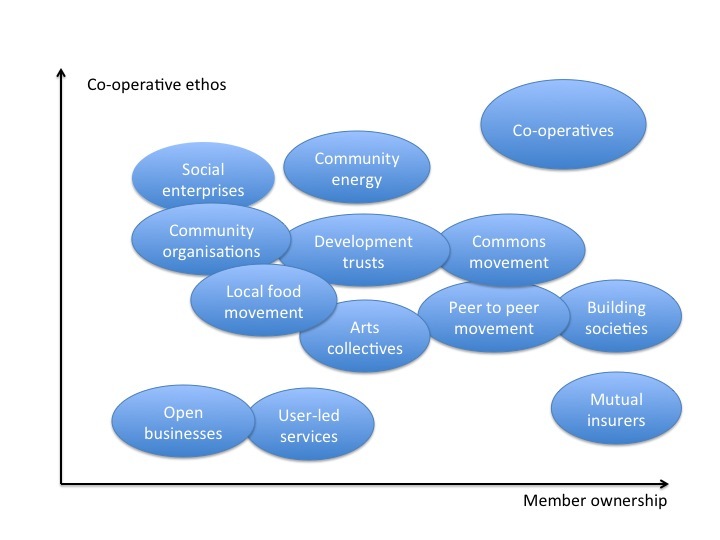 It provides a broad, but useful, way to think about which organisations are close to the co-operative model in terms of both ownership and ethos, and which are less so. A second way is to map the networks, groups or ‘tribes’ around the co-operative movement. 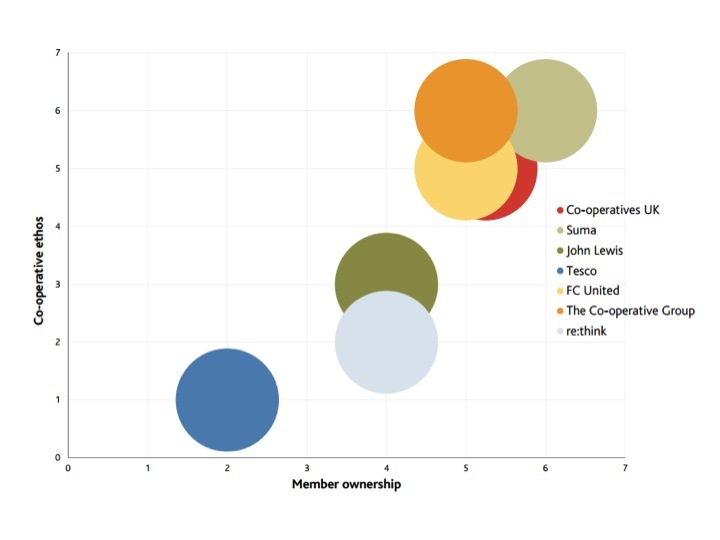 I’d initially done this to look at where there were overlaps between the purpose of the groups and the co-operative movement in order to identify networks on social media where we, in the co-op movement, could make synergies and links. But you can also use the scale of co-operation to structure this in order to see which networks are closest to the co-operative movement, and which are further away. What we see here from this rough application is that the commons movement, development trusts and community energy are closest to the co-operative movement, with other organisations such as open business or user-led services further away. What does this tell us? I think this is a framework to determine which networks or tribes, or which individual organisations or businesses, are close enough to the co-operative movement for closer working and which you should therefore prioritise. It’s very much a working idea rather than a complete one – there are many more networks to consider, and the ones that have been considered here might not be the right ones, and you can drill down into more detail. But I think it provides a useful starting point for discussing who could be useful partners in campaigns or, if like Co-operatives East, you are looking to widen membership, who should be eligible for membership. Once you’ve used this as a mapping exercise and identified who you should focus on, there is then a whole further set of questions around what you want to do with them and what the best way of connecting with them is. But hopefully this framework can help you understand the networks or organisations on which you should focus your energies. Identify the kinds of organisations that are allied with, but just outside, the co-op movement.